Happy Wednesday. I'm Akane Otani, your guide to the markets this morning. U.S. stock futures are climbing ahead of the opening bell after the S&P 500's gains for the year were wiped out in Tuesday's rout. Later today, investors will get data on consumer sentiment and existing home sales—two things that could potentially spur more volatility in an already wobbly market. Plus, our Avantika Chilkoti tells us why falling oil prices have been a boon, not a burden, for some emerging markets. A programming note: we'll be off tomorrow for the holiday, but back in your inboxes bright and early on Friday. Happy Thanksgiving! Global stocks rebounded Wednesday as investors weighed whether the recent selloff was the beginning of the end for the yearslong bull market or a temporary setback. One winner from oil’s steep fall: Emerging markets that are major energy importers. Brent crude, the international gauge for oil, has plunged into bear-market territory, dropping more than 20% from its four-year high hit in early October. On Tuesday, Brent tumbled further, losing 6.4% to its settle at its lowest level of the year. 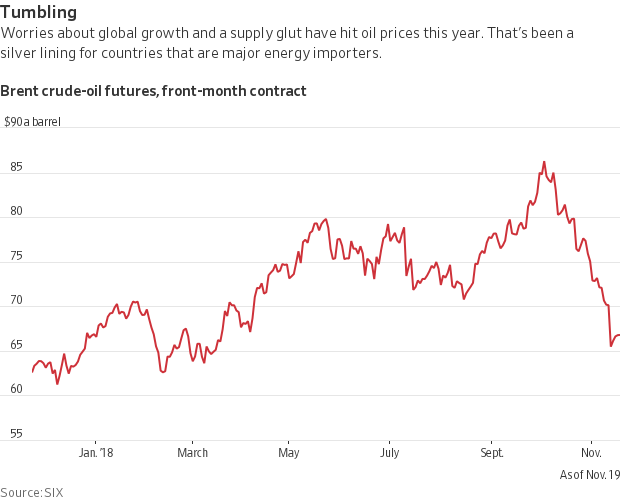 While painful for many investors, oil’s slump is a welcome relief to some of the world’s fastest-growing energy importers, including India, Turkey and Indonesia. They have struggled for much of this year because of the stronger dollar, as well as climbing energy costs. Emerging-markets currencies, in turn, have been buoyed by lower oil prices; importers need to exchange less of their own local currency for dollars to buy the same quantity of crude. The Indian rupee has gained 1.7% against the dollar in the past week, having dropped to record lows earlier this year. The Philippines peso and Indonesian rupiah have strengthened 1.1% and 1.5%, respectively. Meanwhile, the MSCI Emerging Markets Index has gained 1.6% since the beginning of November, although it is still down 16% for 2018. Despite oil’s fall, emerging-market central banks are still wary of inflation and some are still inclined to raise rates, according to Barclays analysts. One reason they aren’t sounding an all-clear signal: It’s not yet clear whether oil’s tumble is temporary—driven in part by traders caught off guard by the extent to which buyers of Iranian oil were granted sanctions waivers by the U.S. government—versus a more fundamental shift in supply and demand. But cheaper crude relieves some of the pressure on emerging-markets' central banks. “Those identifying higher inflation risks such as South Africa and India, may be inclined to strike a somewhat more neutral tone on policy,” analysts at Barclays said in a note to clients. For now, many remain cautious. Even as lower oil prices help the Indian economy, Mukesh Kumar Surana, chairman of Hindustan Petroleum Corporation, said the recent volatility has complicated decision-making for the local refining industry. "The up and down creates inventory losses,” Mr. Surana said. The yield on the 10-year U.S. Treasury note has fallen for seven straight days, its longest streak of declines since the eight trading days through Sept. 27, 2016. After the last month of selling, the Nasdaq Composite is on the cusp of erasing all of its year-to-date gains. If that happened, it would mark the first time since April 6 that the index ended the day in negative territory for the year. On this day in 1792, the Insurance Company of North America debuted for trading, pricing its initial public offering at $10 a share. If you'd bought 100 shares that day, they'd have been worth more than $10.1 million by 1998. U.S. jobless claims, which will also be released at 8:30 a.m., are expected to inch down to 214,000. A 10 a.m. report is expected to show U.S. existing-home sales for October rising to an annual pace of 5.19 million. Also at 10 a.m., we'll get the University of Michigan consumer sentiment index for November, which is expected to register at 98.2, little changed from its preliminary reading. Then at 10:30 a.m., we'll get data on U.S. crude inventories. Stockpiles are expected to have risen by 1.9 million barrels in the week through Nov. 16, according to the average forecast of 11 analysts and traders surveyed by the Journal. Amidst a roaring economy, markets are sounding alarms. The U.S. economy is firing on all cylinders while growth abroad slows. Markets are signaling increased concerns as JPMorgan economists chart a rise in the likelihood of a recession starting within the next 12 months. The Federal Reserve is not likely to be swayed by market declines. Officials at the Fed have indicated in recent days that they plan to proceed with a December rate hike, despite the downturn in stock prices. Deutsche Bank handled $150 billion of potentially suspicious flows tied to Danske. The German bank’s shares dropped on investor concerns about the money-laundering scandal’s impact on its profitability. Crypto markets have taken a steep dive. A bitcoin selloff that started last week picked up speed Tuesday, sending the price of the digital currency sliding. The latest plunge left it about 78% from its all-time high. Small banks to get relief from postcrisis rules. 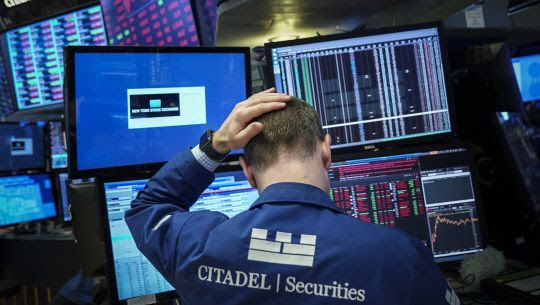 Under a plan approved unanimously Tuesday by the FDIC, banks with less than $10 billion in assets could be subject to a single leverage ratio for their capital holdings, replacing a more complex set of requirements that applies to larger banks. Individual investors are buying busted mortgages. A rag-tag group of individual investors, plus some Wall Street giants, is buying old loans and trying to tease value out of them. Gap: The parent company of Old Navy, Gap and Banana Republic narrowed its guidance for full-year earnings. Foot Locker: The sporting-goods retailer said same-store sales rose 2.9% in the third quarter, sending shares soaring in after-hours trading Tuesday. Autodesk: The design-software provider posted better-than-expected revenue for the third quarter and signed off on an agreement to acquire fellow software maker PlanGrid.